World Services (or WS; renamed TFI Services in 2010) was a collection of secretive, undercover homes or "units" primarily handling finances, publications, and special projects (e.g. Creations) in The Family International. After the Reboot (a restructuring of TFI), World Services was renamed as TFI Services. WS operated under very surreptitious conditions, even from the rest of the group. Such units were often heavily subsidized or fully supported by funds allotted them formerly by David Berg, and now Karen Zerby and Steven Kelly. Members of such units are taught they are the crème de la crème, since they are specially selected for their talents, trusted with very sensitive information, and their units were or are directly answerable to Berg or Zerby. Most WS members were required to clock a minimum of 48 hours of work per week (this number occasionally changes). WS maintained many separate units globally prior to approximately 2003 or 2004 when all WS members relocated to 3 main locations in Albuquerque, New Mexico where Karen Zerby and Peter Kelly also lived and worked. After Ricky Rodreguez's murder/suicide of 2005, all WS relocated to Chapala, Mexico where they took up the rent of 4 large properties (Karen Zerby and Steve Kelly also personally purchased a pair of condos at "Manzanilla" for vacationing purposes. In late 2010, after the "Reboot" had been published to the rest of TFI, WS underwent the "WS restructuring" in which essentially most WS members (many of them older WS members with health problems and families with children) were "let go", the WS structure itself was downsized, one property was let go and another smaller one rented and nearly rebuilt to accommodate the many apartments that were needed, and many of the remaining WS members moved out to rent their own apartments with stipends paid for their work for WS. At the same time as the "WS restructuring", the London "home" and separate warehouse and print office used for printing publications was closed down, the board structure that had been in place in TFI until that time was shut down and the various International Boards (aka "IB teams") that had been operating from within the WS units were shut down along with most of their initiatives. New mothers were required to give their baby to childcare workers and go back to work full-time when the baby was 6 months. Until that time, the mother could work part days but after that the baby was included the daily commute with the other children to a separate "school building" with admittedly committed and caring teachers. The school building was located on the largest property outside of Chapala, Mexico. WS workers were required to fill in daily time-sheets and keep office house, though all worked out of their bedroom/offices. The work environment was extremely intense and high pressured resulting in an unusually high occurrences of insomnia, serious allergies, and other illnesses. WS members could not maintain blogs, Facebook or Twitter accounts, or other social media. WS members could not phone members of their family without first obtaining permission from a "Home Shepherd" and praying with them to be careful about "security". Outgoing email had to be censored by WS "mail checkers". Photos to be sent to family members had to either not show the original scenery, not display short sleeves or any other identifying elements like red brick or tile. Photos could only be sent to personal family. Personal mailing lists and newsletters were disallowed. "Reli trips" (trips to visit relatives) were approved by a team of people a maximum of once every 3, later 4, years. They were paid for by a WS fund. Children of WS members could visit non-WS relatives before they learned to talk and after the age of 12 or 13 or when it was decided that they were old enough to learn to keep secrets. Some WS children would occasionally go on short road-trips with their teachers and a couple parents to nearby Mexican villages to sing and "learn how to witness". WS members received approximately $40 USD personal money each per month, and either an additional $10 alcohol money or occasional provided alcohol. In 2010, WS homes received the authority to decide on what to spend their allotted budgets for in a "Home Council" and so some additional extras were made possible. Any other money received by WS members by gifts or inheritances, were generally expected to be put into the WS common pot and used towards the "reli trips" or medical expenses. WS members were not allowed to have sexual relations with non-WS TFI members. Like all other Family members since 1987, incoming WS members were required to take HIV and STD tests. Identifying tags on clothing or baggage had to be removed before any trips to visit relatives. A members of the "Steering Counsel" was required to physically look through the baggage of outgoing WS members to ensure nothing telling was in the luggage. WS members worked from Monday-Friday 8 hours with one hour lunch breaks allowed. Saturday and Sunday were days off until approximately 2009 when Saturday became a half day off, that could be accumulated for up to 2 days. WS members were allowed about 14 days of vacation days a year. New WS members were giving one day vacation time per month on the first year they arrived. A lot of young families. A less loose and liberal atmosphere than a few years before. There were two main batches of young TFI members brought into WS. The first was brought in at about the time of the "marriage of the generations" and when Rebecca Rapp (an SGA) was brought in, they apparently had their own versions of the "wild WS days" and then calmed down somewhat when their own children were born. The second batch was brought in approximately 2006-2007. There was an odd separateness of people. One would live and work in one's own room (that doubled as an office), meet for devotions some days, and then there were occasional parties. Usually, however, only a few particular groups of people mixed very much and most people were on their own a lot. It was not a particularly happy place and the staff usually felt very alone and isolated. There was a huge focus on healthy living, healthy eating and exercise, to the point that one doctor told one young TFI member that she was sick because she was eating too healthy. The work ethic mixed with the high expectations of a super good spiritual life (translated to receiving prophecies a lot, a daily 1/2 hour prayer vigil, etc. ), which resulted in a lot of stress. The few ultra-organized people who could pull it off were the samples and everybody else tried to live up to. Many Family publications were copyrighted under the name "World Services". Editor's note: This was the structure in 2010 before the Reboot. This diagram was taken from a study by Shepherd & Shepherd, February 2009. It is most likely out-dated. - one of the prime editors of all material leaving WS in the 1970s and early 1980s as well as head of the Publications Department. He left the cult in 1981. The following is an incomplete list of past and present locations of WS units and sub-units. Due to the extremely expensive and time-consuming aspect of moving a unit, they usually avoid trans-locating. As a result of this, many of these units remain in the same area for many years. ↑ Administration — by The Family International; retrieved 2012-01-18. 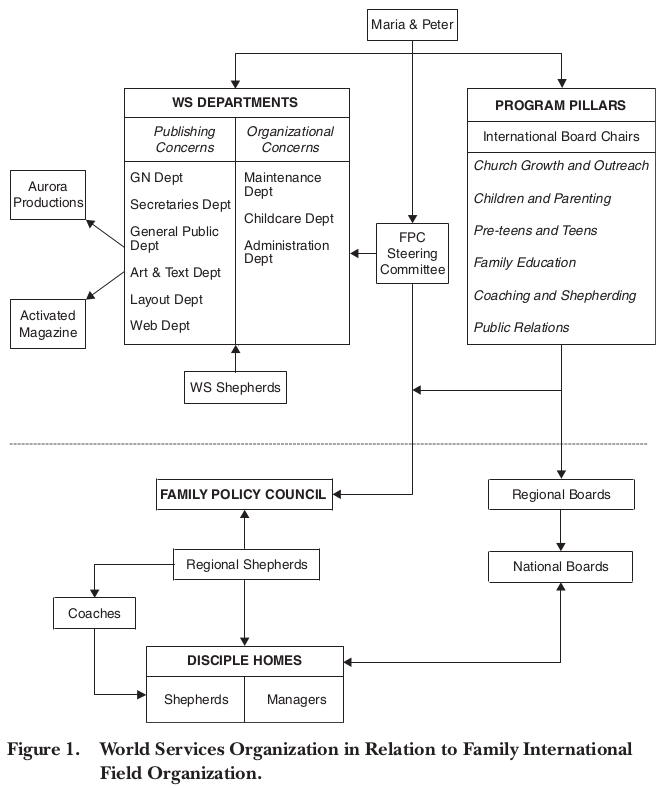 ↑ "Administrative Structure" on The Family International Wiki. Retrieved on 2012-10-28. ↑ Gordon Shepherd, Gary Shepherd (February 2009). "World Services in The Family International: The Administrative Organization of a Mature Religious Movement". Nova Religio: The Journal of Alternative and Emergent Religions (University of California Press), 12:3. pp. 5-39. This page was last edited on 29 October 2012, at 00:49.